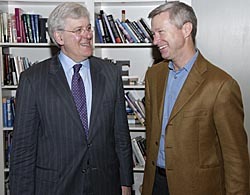 Robert Meister (left) and Stephen Bruce. Photo by Jon Kersey. SANTA CRUZ, Calif.--As a boy growing up in Santa Cruz, Stephen Bruce often played with kids whose parents were professors at UCSC, so when it came time to choose a college, he didn't look far. "It was the best thing I ever did," says Bruce, a graduate of Santa Cruz High School. "I wanted to study. I wanted to learn how to think." Bruce lived on campus and spent his first year playing "major-of-the month," before deciding on economics and discovering politics professor Robert Meister. For Bruce, the combination of economics, politics, math, and philosophy was the key that unlocked the door to learning. "You can take economics, but unless you take math, too, the lights don't come on," says Bruce, who earned a B.A. in economics in 1979. Bruce channeled what he learned into a fast-moving and rewarding career in asset management, investing billions of dollars for some of the biggest banks and financial institutions in the world. He recently reconnected with UCSC, where he is opening doors for students by funding a fellowship for aspiring high school math and science teachers, and creating a fellowship for graduate students in politics. "I was thinking through how you can help people, and it's really education," says Bruce. "I don't have a lot of time for runaround, and I got zero runaround when I called UCSC." Engaging and personable, Bruce is as comfortable in Gap and Banana Republic as he is in Brooks Brothers, despite a globe-hopping executive lifestyle that includes frequent travel from his home base in Los Angeles to London, Tokyo, and Sydney. After graduation, Bruce says he headed to San Francisco "armed with my Marxist economics and Birkenstocks to work at Wells Fargo Bank." It was his grandmother's idea to work for a bank, which she said provided the ultimate job security--once hired, she was certain, he'd never have to look for another job. But Bruce soon began looking around, and at the suggestion of a friend, left Wells Fargo for Stanford Research Institute. Fascinated by how people make decisions under uncertainty, he attended classes in applied math, optimization, and decision analysis at Stanford's business and engineering schools. Bruce first worked in financial analysis and risk management at World Savings in Oakland, where his career began to take off. He eventually got involved in capital markets, working in fixed income and dealing with New York banks and ultimately reuniting with his Cowell College buddy Craig Schiffer at Lehman Brothers in New York. In the early 1990s, the bank loan market was just opening up, and Bruce was in the right place at the right time. He and partners Christopher Damico and David Forbes-Nixon struck gold in 2002 when they founded Alcentra, an international asset management group with offices in Los Angeles and London that caters to institutions all over the world. Their clients, whose names Bruce declines to reveal, count on them to manage funds in excess of $12 billion. Alcentra didn't start in a garage, like Hewlett-Packard, but Bruce describes his ascent to the top of the financial pyramid with a Santa Cruz-style casualness. "When we wrote up our original business plan, we figured there was virtually no way we'd hit the numbers, but we did," he says. "We blew through them. It was a huge success." Even the name of the company was the product of Damico's imagination. "I think it sounds like the name of a minivan or a pharmaceutical company," quips Bruce. But there's nothing make-believe about Alcentra. Last year, the Bank of New York acquired an 80 percent interest in the company for an undisclosed amount; Bruce and his cofounders retained a 20 percent interest. All three remain engaged in the company--they're contemplating a New York presence, and the Bank of New York recently acquired Mellon Bank, which could greatly expand the scope of their operations. Bruce and his wife, Mona, are also busy raising two young sons, Kellen and Ryder. Their gift of $157,500 created the Mark Bruce Fellowship for Math & Science Teachers at UCSC in honor of his brother, who died in the September 11 attacks on New York City. "He was on the 102nd floor of the first tower. He didn't make it out," says Bruce. The fellowship will support UCSC graduates of math, science, or engineering who enroll in the California Teach Program through UCSC's master's/teaching credential program. Bruce also established the Robert Meister Scholars Fund to support graduate students in politics at UCSC and honor his professor. His gift of $250,000 will make it possible for a $50,000 fellowship to be awarded to a different student pursuing a Ph.D. in politics each year for five years. Although Bruce's parents have moved out of Santa Cruz and he hasn't stayed in touch with the campus, Bruce is eager to reconnect. In addition to Meister, he has fond memories of taking classes with economics professors Alan Richards, Donald Wittman, and John Isbister and philosophy professor Carlos NoreÃ±a--some of the educators who helped teach him "how to think." "When you combine economics with game theory and decision theory, you start to learn how people think," says Bruce. "If you combine that with probability, you see how people make decisions. Having things go your way is really just consistently making good decisions and accurately assessing what the outcomes may be."